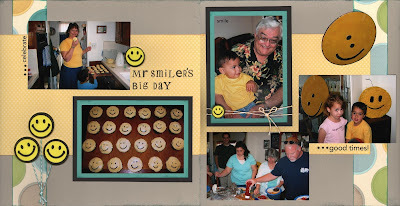 National Scrapbook Day Challenge #20 at Let's Scrap was to use at least 5 different scraps of paper on your layout. I think I need to do this challenge about 300 times to clear out all the scraps in my stash, but I did use up a few pieces of scraps on this layout! 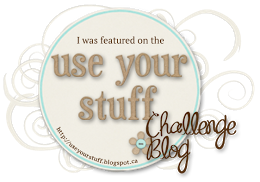 I'm trying to sneak in another challenge from Let's Scrap before the deadline (May 31st! ), so here it is. We were asked to use the provided sketch and create a birthday layout that didn't look birthday-ish! I had to think about this one for a while, but I finally came up with these great photos from my son's first birthday. 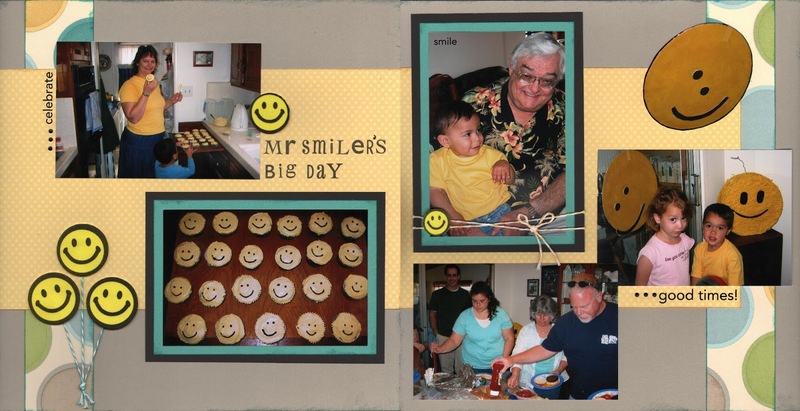 Since he was such a cheerful baby, we nicknamed him Mr. Smiler, so the choice of a happy face birthday party was really a no-brainer. A friend gave me the happy face foamies seven years ago and they've been waiting for me to get around to scrapping this event! It's been a while since our last Variety Challenge for Splitcoast Stampers, so here's another fun one to try. To play along, simply click the link below! Gray is the new “go-to” neutral, so create a layout using gray as your primary neutral. 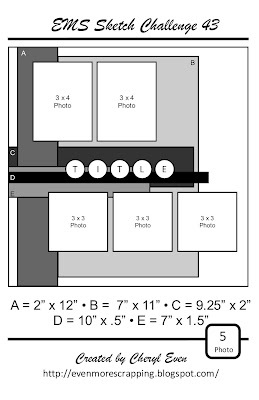 Here's my layout. This was a fun challenge for me, since I would have usually gravitated towards using a tan color as my neutral. However, since there is a lot of gray and blue-gray in my photos, I like the result. Happy Memorial Day to everyone! Our family raised our flag this morning and said the pledge of allegiance, and now we're looking forward to a barbecue with friends this evening. 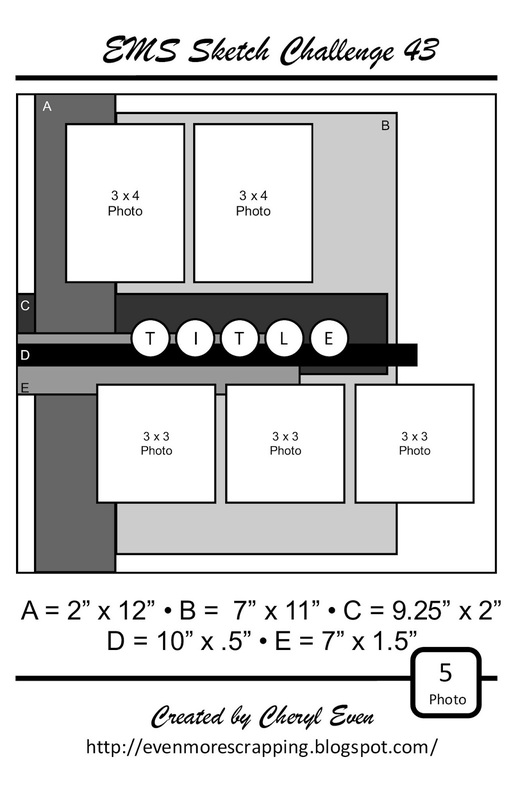 As a special little Memorial Day bonus, I whipped up a fun sketch challenge for you all.There's room for 10 photos on this layout, or you could switch the smaller photos on the left page out for a couple of 6"x 4" ones and still be able to scrap 8 pictures. I added some stars and stripes in honor of today, but you can use any embellishment that suits your theme. Have fun and don't forgot to share your finished work so I can ooh and aah over it! 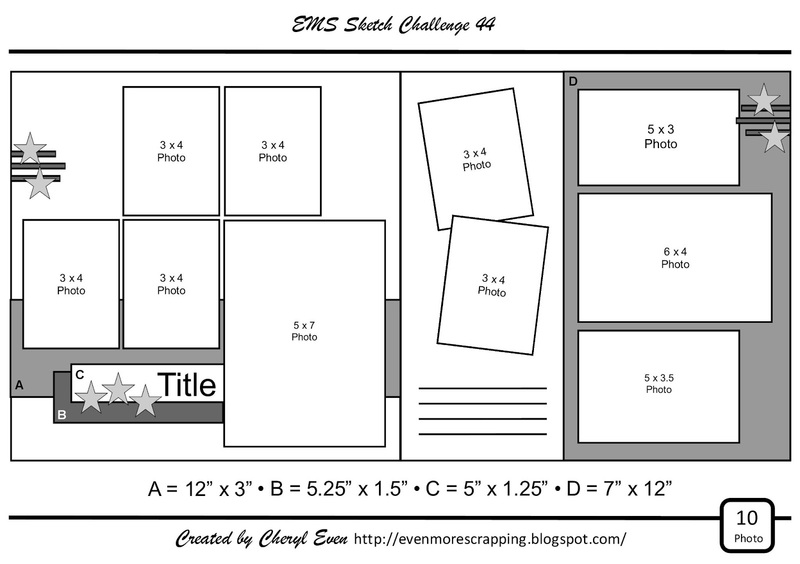 Check out a sample layout using this sketch here! Both 4 Crafty Chicks and Heart 2 Heart had challenges this week to use critters / creatures on our artwork, and Little Red Wagon was asking to see puns, so I put these three challenges together with this funny picture of my son Elliot when he was a baby and came up with the title for this layout. Hopefully I do not have to explain the bunnies on the layout. If I do, it's just not as funny as I thought it was! Oh well, at least I used up some old CTMH supplies . . . 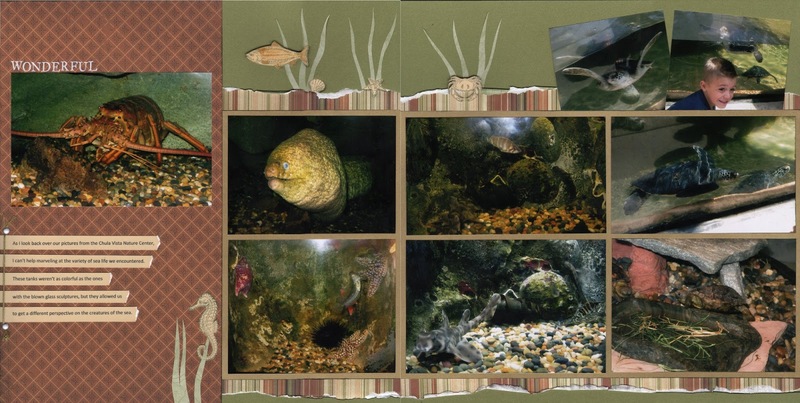 I finally got my photos developed so I could do the "12 Ages and Stages" challenge over at Let's Scrap.We were given a sketch and asked to create a layout using 12 photos that represent something in our lives. I chose to use photos from my younger son's adoption day, since it took 12 months from the time he was placed with us until we went to court for the finalization. The journaling is written on the tags, which pull out so you can read them. I also was inspired by the Cupcake Special #3 Challenge from 2 Broke Girls, which led me to pick the circle paper and add the flowers because they reminded me of elements on the cupcake! And here's my layout. 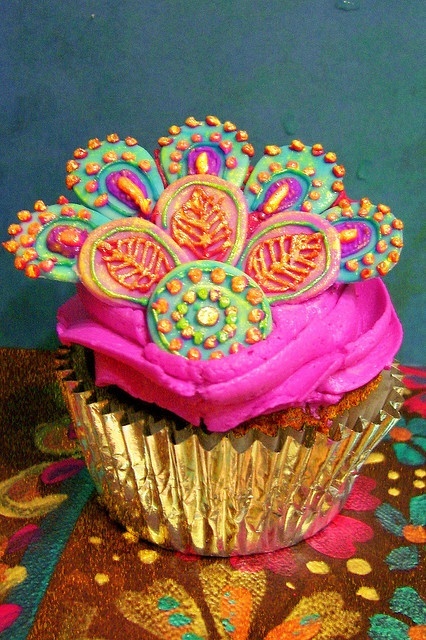 Obviously I did not go with the color scheme from the cupcake, although there is chocolate and yellow on my layout . . . 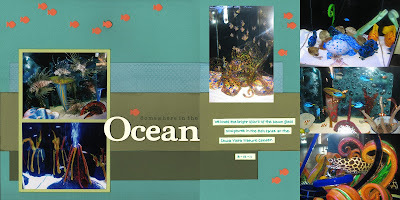 I skipped ahead to Challenge 13 from Splitcoast Stampers' Virtual Scrapbook Night. 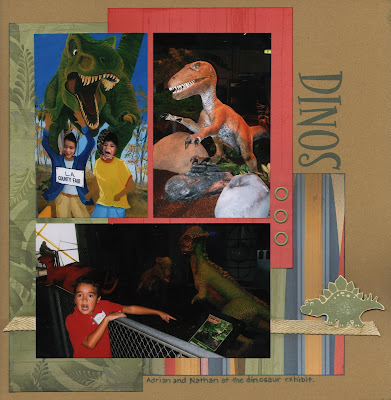 Sharon's mom has a favorite saying, "Oh, shoot a pickle!," so Sharon's challenge was to scrap a page that was either predominately green or was about food. I chose to go the food route, since I had some pictures of a potluck event at church. I started with Sketch 32 from Sketch-N-Scrap (it's actually a single page sketch but I mirrored it for the second page) and added spots for the Southern Girls Spotty Dotty challenge and flowers for the Heart 2 Heart May Flowers challenge. Two posts in one day - wow! I got a lot of scrapping in today, so I thought I'd share another layout with you. I wanted to play along with challenge 2 from Virtual Scrapbook Night at Splitcoast stampers: try making a layout without any white on it. Create your own “white space” without one drop of white. 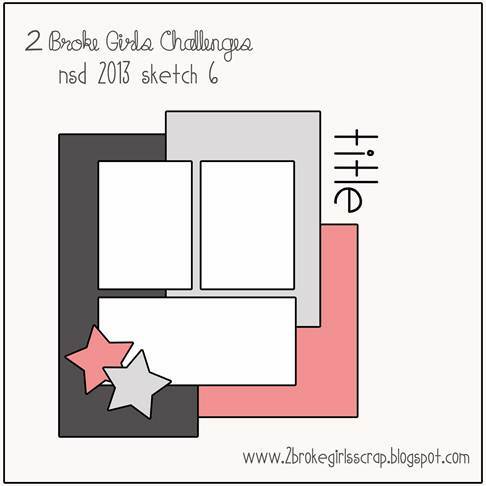 I started with National Scrapbook Day Sketch 6 from 2 Broke Girls. And here's what I came up with. I forgot I wasn't supposed to use white and I added white ribbon, so then I had to sponge my ribbon with Bamboo ink to get it to a different color! Guess I should have had the challenge right in front of me while I was working . . . 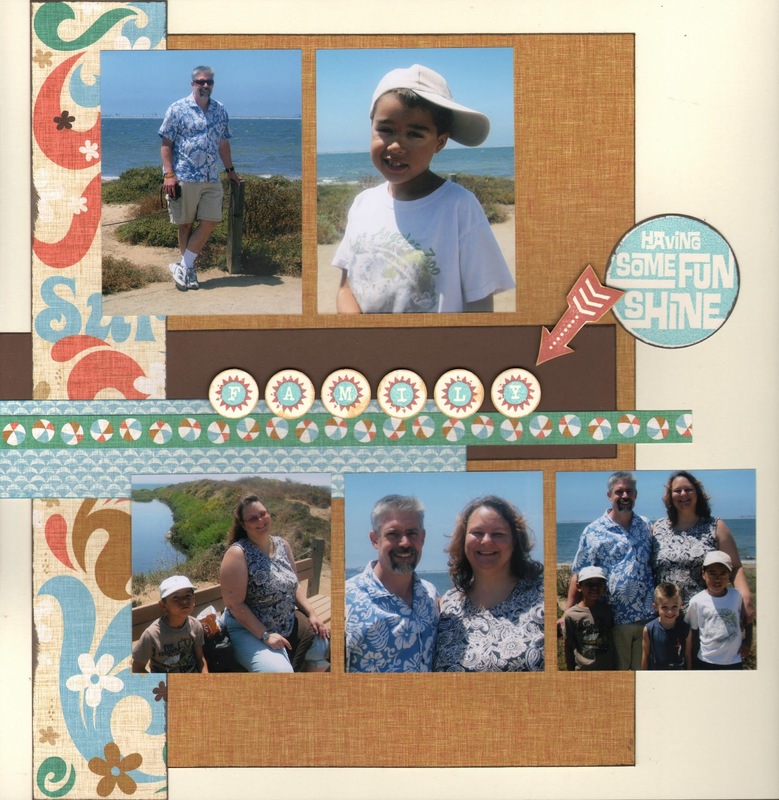 I'm hostessing a challenge over at Splitcoast Stampers for their Virtual Scrapbook Night. Come join us! The theme this time is My Mother Always Said, and here's my challenge: One of the things I remember my mom saying often as her four children ran in and out of the house was, “Shut the door! Do you think we live in a barn?” As a mom myself now, I find myself shutting doors after my kids all the time, so I can understand her frustration. 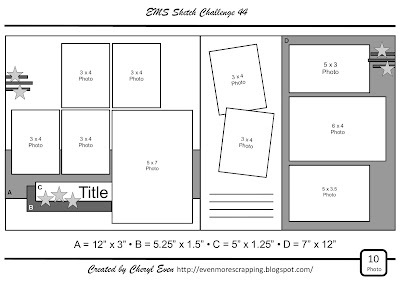 My challenge: In honor of mom, please create a layout that has a “door” on it. It can be a stamped or die-cut door, or it can be something that opens and closes like a door or it can be a totally different idea that you dream up. Get creative and have fun! 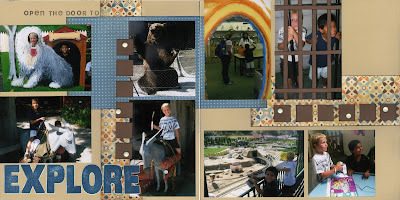 For my sample, I chose to scrapbook pictures of my son at the fair, and I not only incorporated the idea of the door in my title, but also made a swing-open door for the picture of my son and his buddy in the "jail" at the fair. 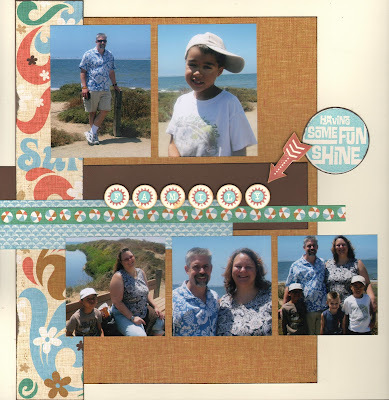 It's the second Wednesday of the month and I usually post a Variety Challenge for Splitcoast Stampers, but we're having a week-long Virtual Scrapbook Night with tons of challenges, so I'm taking a break to allow people to participate in that. Feel free to hop on over and check it out! 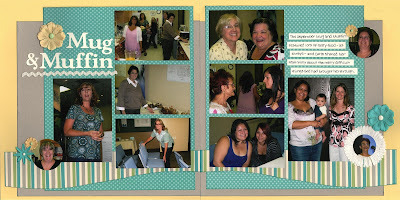 The theme is "Mother Said," and all the challenges are oriented around mom-isms. 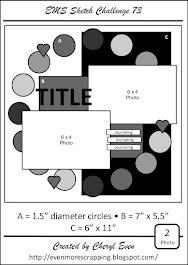 Here's my first layout, based on Fashion Mom-ism #1, and the challenge is to do a simple, 1-3 picture, monochromatic layout. (There's another challenge for the "wild child," but I'm definitely in the "dutiful child" category)! My layout is based on shades of brown, but I did throw in a pop of yellow, so maybe there's a little bit of the wild child in me after all! I discovered a new challenge site this week, 2 Broke Girls, and thought I'd give one of the challenges a whirl. The Last Bite word challenge asked us to build a layout around either "He" or "She." 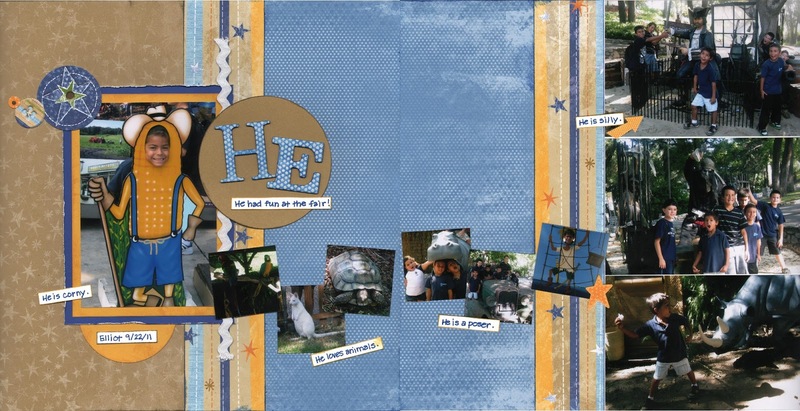 Since I have boys, I picked "He," and my layout features pictures of my son at the fair. 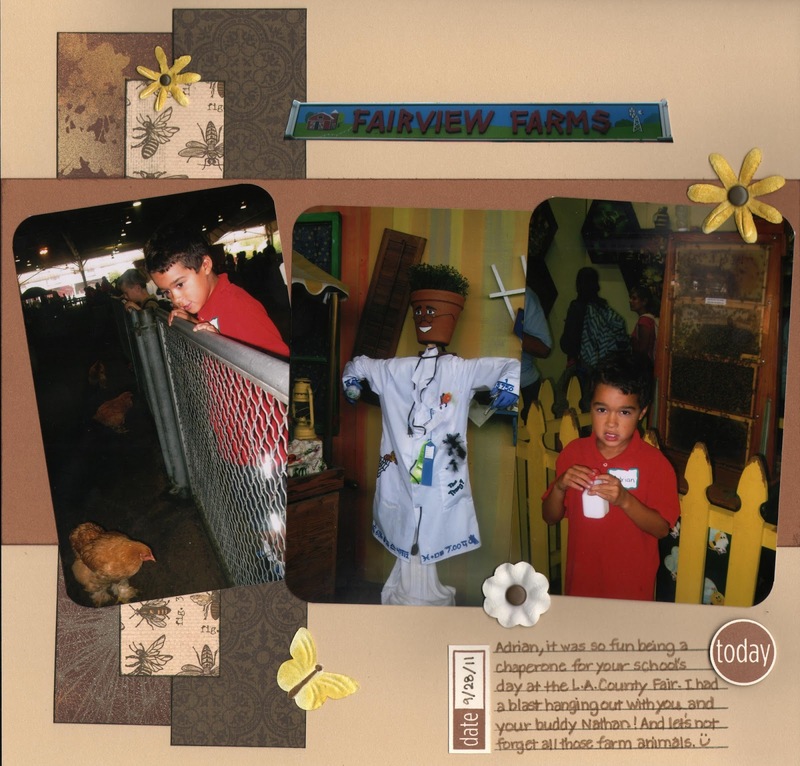 My journaling uses phrases that start with "he" and describes his experience at the fair. I also used papers from my stash that are several years old, so I'm entering this into the Clear It Out challenge to use 2 or more patterned papers. I couldn't find exactly the right sketch for these fun family photos, so I created my own featuring five small photos and several strips of papers. A layout could easily be constructed using scraps from your stash. Have fun, change up what you need, and don't forget to let me know if you get a chance to use it! 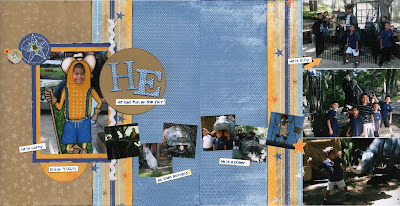 Color My Heart has a challenge to use Cocoa, Saddle, and a color of our choice on our layout or card. 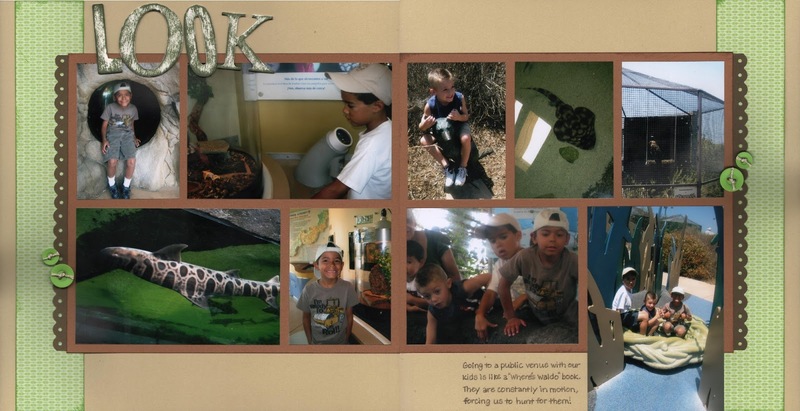 I chose to add Pear to this layout of pictures from the Chula Vista Nature Center. DE Monograms "L", "O", "K"
National Scrapbook Day Challenge #3 at Let's Scrap was to use a line from the provided bingo card and place all the elements on a single layout. 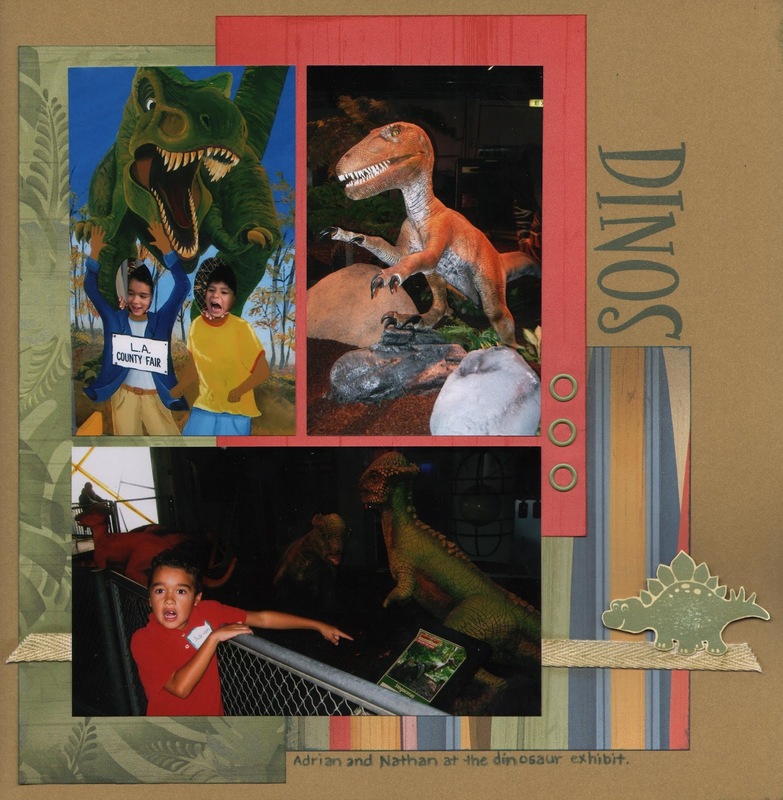 I chose the line that said distressing, ribbon, sketch, one photo, and hidden journaling. I'm not really big on scrapping just one photo, but this seemed like a perfect opportunity to get caught up on my older son's school album. 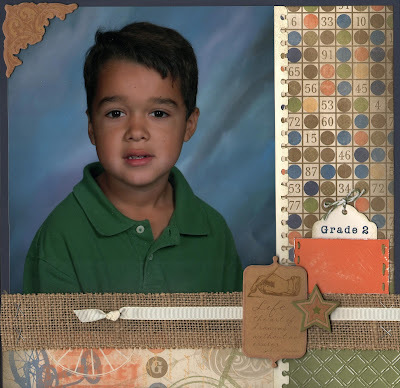 He's graduating 5th grade in June and I'm still on 2nd grade photos! As I scrapped these pictures from the Chula Vista Nature Center, I couldn't help marveling at the variety of sea life we saw. These tanks weren't as colorful as the ones with the blown glass sculptures, but it allowed us to get a different perspective on the creatures of the sea. 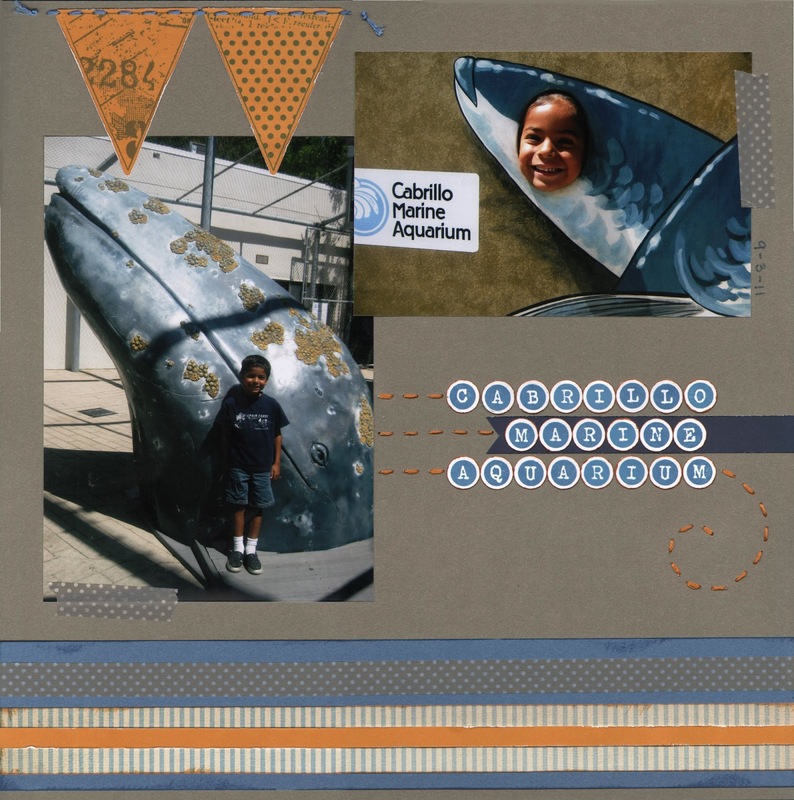 I played along with the Keep It Earthy challenge by Vicky from Splitcoast Stampers, who asked us to use earth tones in our scrapbooking. It was also fun to use one of my previous sketches and see how different I could make the finished layout. Click on the link at the bottom to see the sketch and my original layout! I'm embarrassed to say that I printed out these pictures in 2008, picked out papers and purchased ghost letters to use on the layout, and then put the whole project away in a page protector and never got back to it. I think the bold colors of the Basic Grey papers overwhelmed me a bit, and I wasn't quite sure what to do with the ghost letters. I found the package today and determined I would finally scrap it. A Let's Scrap sketch gave me a place to start, and then I chose a title and a fun quote to use so I could participate in the quotes challenge from Southern Girls. Painting the letters made them stand out, and I topped it off with a die-cut sun and some clouds. 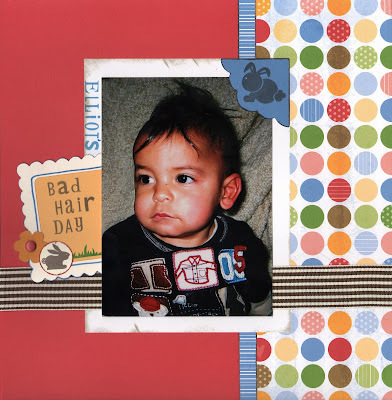 Let's Scrap is posting a daily challenge in celebration of National Scrapbooking Month. I don't think I'll make it to 31 layouts, but it sounded like fun, so I'm going to play along as often as I can. The first challenge was to "create a layout using a quote from your favorite book. It can be the title or somewhere on your page. 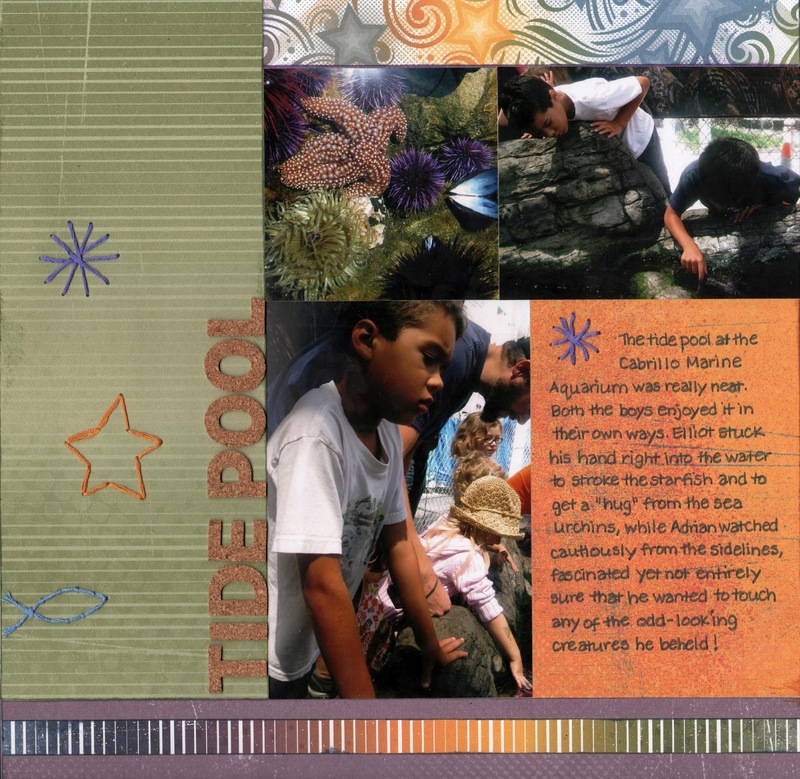 Let the book inspire the colors and details on your page." 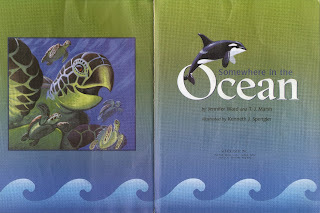 Since I was scrapping pictures of sea life, I immediately thought of a book that had been my children's favorite for a long time: "Somewhere in the Ocean." I loved reading it to them, so I decided to use the title (which is also repeated on every page) as my layout title. 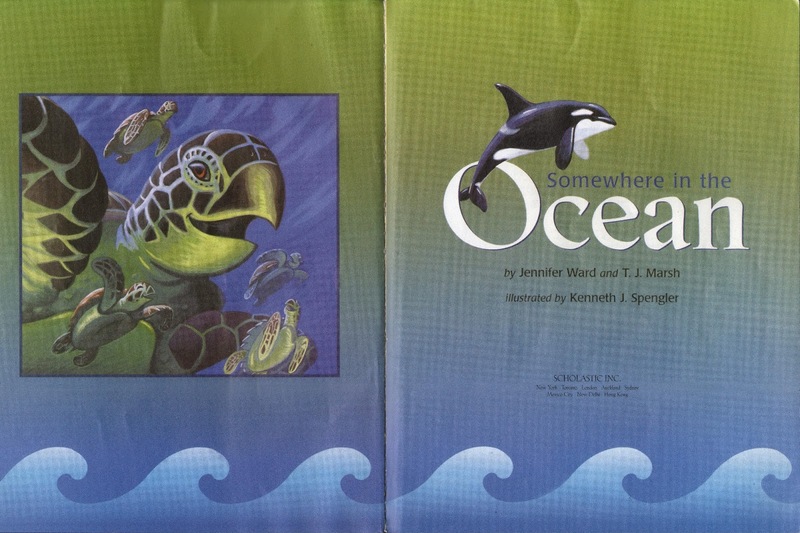 I also lifted the title treatment, and the idea for the colors of the page came from the title page.